I originally wrote this back in 2012. I came across it recently, and liked it. So I’m republishing it for general information. It all starts by converting a single energy unit from the sun. A photon (a particle that carries electromagnetic force). A photon particle released from the sun takes about 8 minutes to reach the earth (Wow – even at the speed of light!). The photon can be harnessed to convert its energy. It’s useful for humans! Within each square meter of sunlight that reaches the earth’s upper atmosphere, there are about 1,400 watts of available energy. The available energy is reduced to about 1,000 watts per square meter by the time it reaches the surface of the earth. Additional factors reduce this number further. They include one’s geographical location, season, time of day, weather, and the efficiency of the solar energy system. But that gives you an approximate idea of the available energy from the sun here on earth (per square meter). You might say “about” 800 watts per square meter. There are different types of solar energy systems. 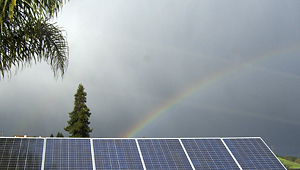 When thinking of solar power, most people think of solar panels often seen on rooftops. They simply generate electricity (photovoltaic solar panels). There are also solar panel systems that use heat absorption properties to heat water. Hot water for homes or even for heating swimming pools. I had one of those, years ago back when we had a swimming pool. We installed black panels (each loaded with smaller tubes) which were really good at heating water that we pumped through the system. In the desert southwest, large solar electric power generating systems have been built that direct the sun’s energy using a huge bank of mirrors. Together they create a powerful solar beam that focuses light onto a boiler that produces steam. In turn the steam spins a turbine that generates electricity. A solar cooker is a great way to take advantage of the sun’s energy. (Note: solar cooking typically retains most of the moisture and nutrients of foods. The result tastes great!). Solar systems, be it for electric power generation or for other energy conversion systems, don’t need to be large and overwhelming to be useful. The truth is, even small systems are useful. They can be an effective energy solution to assist your needs during a short-term power grid failure, or even longer term. Having just enough to power a refrigerator and/or freezer, some lights and a radio, may be all you need to save your food and to make it through an event. A larger system will of course increase your creature comforts and could be put to use in many ways. It’s all scalable. A solar oven can be built fairly easily. There are many plans and designs available on the Internet (and for sale by some manufacturers). If you are interested in solar energy, this is where I might start. Building a solar oven can be a fun and rewarding project. Even if building things aren’t your thing, buying and using one is also very rewarding. It will save money on electricity/fuel (over time) and will serve as an emergency method of cooking food. Continue reading: Solar Oven Cooker – A quick look. Building a small electric power generating system with PV solar panels doesn’t have to be very expensive. Although unfortunately they are not cheap either. A significant amount of money can be saved if you have the skills to plan, purchase, and install the system yourself. Most electric solar power systems can be expanded upon. So you can start small and add on later if you wish. Solar panels come in a wide range of power-generating sizes, and are priced accordingly. Some systems are designed to tie into the electric power grid and ‘back feed’ the electricity that you are not consuming to the power utility company for credit. Other systems are stand-alone (off-grid). They’re usually tied in with a battery storage bank to store and provide power for when the sun is not generating electricity. The point is, if you are interested in becoming less dependent upon external systems for your energy needs, consider solar. Do some Internet research and discover this alternative energy world and what it can do for you. The house we rented in Hawaii had solar water heat, to assist the standard system. When it broke, our heating bill went up $40+/month (in the early 90’s). We have a solar food dryer ,the thing is older than dirt ,works great ,,found it at auction ,,, home made , did 8 buckets of prunes at once ,(yes it’s big)two days in summer sun ,i seem to remember plans for one like it in mother earth mag ,way back in the early days ,1970s ? OH, I have some plans for a large solar dehydrator.too many things ahead of making it are on the list of things we must do.Hoping we get enough veggies that require it to be moved up on urgent list. humidity is really high here all summer… wondering if we should give i a secondary heat source and extra venting./thermometer. will do. one of mails is down.probably be june for that. I’d be interested in anyone’s experiences with solar water heaters. They are common in the rest of the world, and I am vaguely aware that the Israelis are quite advanced in this technology, but I don’t recall ever seeing rooftop mounted solar hot water heaters on the US mainland. Seen them in Puerto Rico, though…. I have solar water heaters on the buildings on my property in Hawaii. They are about 4’x8′ panels with a 85 gallon Electric water heater tank for storage. It has a recirculating pump to keep the water at the same temp. There are also the other type used that has the tank incorporated in the system on the roof. I understand that they have a tendacy to leak over time but that’s not fr ol m personal experience. I personally have made a solar water heater from an old one. Stripped it down to the tank painted it black. Then I built a box for it. Painted the interior flat black.built a door with glass and plumbed it up. The only downside to this design was the loss of heat from the water overnight. You could move the heated water to another standard tank to keep it hot overnight. I have built a rocket stove style water heater system with my grandson. @OH. We did the same thing years ago at cabins in southern MO. Used 1 inch black PVC pipe coiled up on the roof of the outside shower stall. It will make water scalding hot. So we put hose barbs on the ends and then did the same with cold water and ran it through two spigots for mixing. Then out an old school pull chain shower head. Worked great. I have three Novan water panels I plan to use to heat the floor slab in the new canning kitchen. Using the data here, I should be able to get 25K BTU/HR for about six hours a day. Pumped into 275 cubic feet of concrete in the slab, I am hoping this is going to help cut my energy costs, or at least hold the room above freezing through the winters. I really have no idea about the question I’m asking, but it seems like I saw something in the distant past about using something out of a big screen TV and I can’t remember what it was or what it was for, but I’m thinking it had something to do with making a solar oven or solar cooker. Can any one help me out. Trekker Out. You’re thinking of Fresnel Lens. It has been many years since they have been a part of big screen TV. You won’t find them today unless an old TV set (some of which were designed with them). If it the lens in our old still working tv. One can find them in tv’s up to 2004-05 just as the LED screens came into popularity. National Geo ‘preppers show’ there was they guy who used it for a solar distiller, it worked. He had to be careful as he almost started a fire with the lens. That is if we are referring to the same style tv screen.